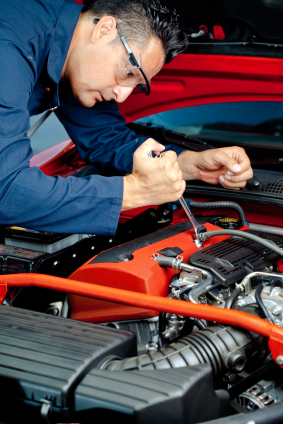 "Being new to the Oceanside area (from Scottsdale, AZ), I needed to locate a new auto repair/maintenance shop. As everyone knows, finding a good and honest mechanic is sometimes a real "crapshoot" because you are taking a chance. I read a great write up of TNT in the O'Sider magazine, and saved the article. Well, it came in handy as the check engine light came on which of course required diagnosis. I called TNT (late on a Thursday afternoon) and Nancy told me she could scan the vehicle (and perform a scheduled oil change) the next day. I dropped my car off and later that afternoon Nancy called with the diagnosis that I needed a new catalytic converter. She was totally honest with me and advised that her shop could do the work but because of the year and model the price would be high. She told me that she called Warner Muffler, who could install the CA certified CAT for less than her shop could purchase the part, and recommended I contact Bret or Jim at Warner for an appointment. WOW! I'm so impressed with the great ethics of TNT!!! Nancy could have had her crew intall the CAT and bill me the high cost, but put my financial needs first by recommending Warner Muffler. To me this is the epitome of a great business. TNT now has my loyalty and I will take my car to their shop for all future repairs/maintenance." "Hands down the most professional group of people you could ask for. Starting with Nancy to the mechanic. Thank you for your help in repairing my car. They use Toyota parts what I am so thankful for. I left very satisfied with the work and would highly recommend this company"
"Thank you so much for fixing my car. Nancy and the service department were professional and courteous. I would recommend this shop to anyone who needs their car serviced hands down. Thank you again Nancy." "I felt really comfortable with everyone I interacted with in the shop. I was pleased and surprised at how clean everything felt! It is so nice to have a space to wait and the cookies, coffee and treats in the waiting room were a great amenity for myself and my son. I never had a car repair that I left feeling totally not stressed! I usually avoid any car matience for as long as possible (I know...) but I wouldn't hesitate to come back here! I was really happy with the information I received about my car and will go back with any further needs." "After ongoing and continued business dealings with TNT, I can say without reservation, that they are the best repair facility I have ever used. The owners are very honest and great people to deal with, prices are very reasonable and the mechanics who work on my car are very good also. I never worry about anything with them taking care of my car." "That I'm sad that I'm moving because I am no longer satisfied with service elsewhere." Dealerships: I have found them many times trying to rip me off. TNT: never"
Respectfully Nancy Clason, TNT Services"
"They go above and beyond to take care of the customer. I never feel like they are trying to make money off of me." "I would say the mechanic Tim at TNT who works on my car is one of the best, and I have been driving for over 40 years and have dealt with a lot of service technicians. Not to mention, he is willing to discuss problems, explains what was done/what is needed/what the nature of the problem is, which I find especially valuable and reassuring. I travel on mountain bike trips to remote areas with no services, and my car, even though an older car, needs to be reliable. I know I'm a *little* OCD about my cars, but with the help TNT gave me with my recent head gasket and drive shaft problem, I know I won't have to worry. The service and people here are great and I would highly recommend them without reservation to everyone I know." "I would say the mechanic Tim at TNT who works on my car is one of the best, and I have been driving for over 40 years and have dealt with a lot of service technicians. Not to mention, he is willing to discuss problems, explains what was done/what is needed/what the nature of the problem is, which I find especially valuable and reassuring. I travel on mountain bike trips to remote areas with no services, and my car needs to be reliable. I know I'm a *little* OCD about my cars, but with the help TNT gave me with my recent head gasket and drive shaft problem, I know I won't have to worry. The service and people here are great and I would highly recommend them without reservation to everyone I know." "Outstanding . I wont take my cars any where else for service. They are the best there is !!" "Excellent service, upfront and HONEST. Unlike any repair shop I have ever been too. Will definitely be taking both my vehicles back again."